Captured near the Iowa-Minnesota border: this red-hot Plymouth Prowler with a cool matching trailer. Or is a 2002 model, and therefore a Chrysler? To me they are all Plymouths, but maybe I'm a disgruntled Plymouth owner carrying a grudge over the demise of another historic nameplate. 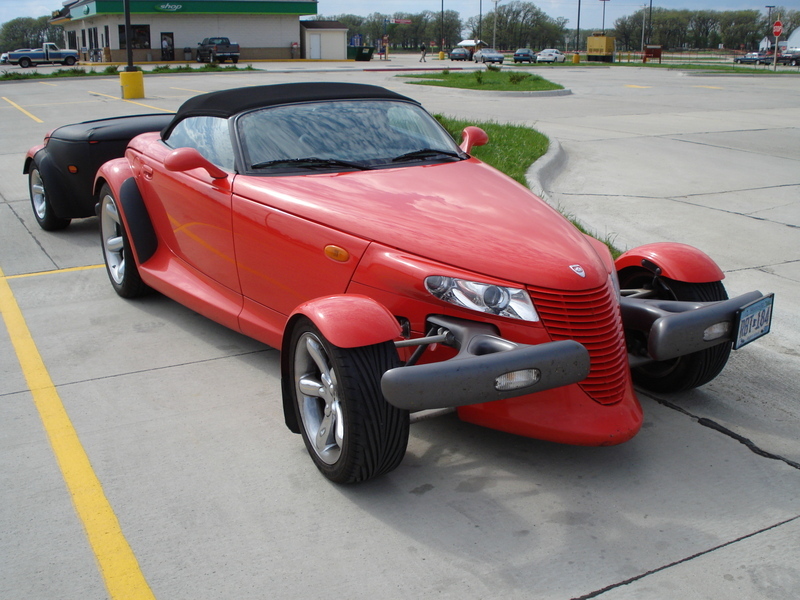 Almost 12,000 Prowlers were manufactured between 1997 and 2002 (though no 1998 model was offered) and they are as eye-catching as ever. 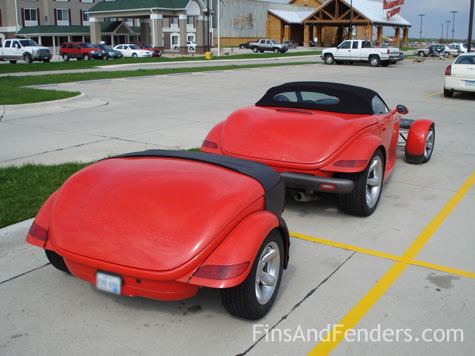 Did they start the retro-styling movement carried on by the Chrysler PT Cruiser (also orginally planned as a Plymouth release), Chevrolet SSR, Volkswagen Beetle, Ford Mustang, and others? You bet. Our classic car DVDs don't feature any Plymouth Prowlers, but our Chrysler Performance West Fall Fling VII DVD has something for every Mopar and muscle car lover on your holiday or birthday gift list.